Welcome to F4WOnline.com's live coverage of UFC 225: Whittaker vs. Romero 2, emanating from the United Center in Chicago, Illinois. The Octagon returns to the Windy City with the deepest fight card of the year, headlined by what has become a non-title fight, but with another title fight still on the card and a slew of big names all along the card. UFC Middleweight Champion Robert Whittaker will fight Yoel Romero in the main event. It was scheduled to be a championship fight, but Romero missed weight on Friday, coming in just over at 185.2 pounds. The fight remains a five-round affair, but Whittaker will walk out of Chicago remaining the champion, win or lose. Whittaker does hold a previous win over Romero, at UFC 213 eleven months ago. In the co-main event, it will be a battle for the Interim UFC Welterweight Championship as Rafael Dos Anjos takes on Colby Covington. Both men are on impressive win streaks, as Dos Anjos is undefeated since moving to 170 pounds, winning three straight, while Covington has won five straight bouts. The winner should be in line to face UFC Welterweight Champion Tyron Woodley later this year. Also on the main card, former UFC Women's Bantamweight Champion Holly Holm welcomes Megan Anderson to the UFC in a fight that could set up the next challenger for Cris Cyborg, former UFC Heavyweight Champion Andrei Arlovski takes on Tai Tuivasa, and former WWE superstar CM Punk looks for his first professional MMA win after a trying few weeks as he battles Mike Jackson. In a star-studded preliminary card, we have Alistair Overeem taking on Curtis Blaydes in heavyweight action, women's strawweights Claudia Gadelha and Carla Esparza do battle, former UFC Light Heavyweight Champion Rashad Evans returns to 205 pounds to take on Anthony Smith, flyweights Joseph Benavidez and Sergio Pettis take on each other looking for a title shot, and popular lightweight Clay Guida takes on Charles Oliveira. Ige with a quick combination and he gets Santiago to the ground and is in the mount. He is dropping punches and takes the back and is landing big punches from the back. He is working for the choke but still landing hard punches. Santiago in tons of trouble and the referee stops the fight. Wow. Ige with a dominant victory in the first round. Oliveira with some kicks early. They trade punches. Guida now with some leg kicks. Both are finding their timing. Oliveira lands a left hand. Guida has a cut and Oliviera lands a right hand and grabs the neck on a Guida takedown and it is on tight. Guida taps as there was no escape there. Oliveira with a big submission win in the first in a fight he took two weeks ago. BREAKING: In between fights, it was announced that UFC Flyweight Champion Demetrious Johnson would be defending against Henry Cejudo at UFC 227 on August 4 in Los Angeles. It is the second fight between the two as Johnson defeated Cejudo by first-round TKO at UFC 197 in April 2016. Benavidez with an early series of leg kicks. They trade punches and Pettis lands a clean right hand. Pettis tags and hurts Benavidez with a right hand. He lands another and Benavidez is in trouble early. Benavidez gets a takedown into the guard of Pettis and it will give him time to recover. Pettis able to scramble to the feet and they are clinched against the fence. They trade strikes as both are landing. Pettis lands a right hand. Benavidez is keep his hands low. Pettis lands a right as Benavidez comes in range. Benavidez with a leg kick. Pettis with a head kick as Benavidez shoots in and has a leg but Pettis defends and breaks away. Pettis lands a left jab. 10-9 Pettis. Benavidez lands a quick combo to start the second. Benavidez pushes Pettis against the fence in a tie-up. Pettis was able to get out of the clinch and they're back to the center. Benavidez with a leg kick. Pettis with a high body kick. Benavidez with one of his own and they clinch against the fence. Benavidez working hard for a takedown against the fence but Pettis defends and they break. They trade kicks. Benavidez with a leg kick. They trade punches and Benavidez back working for a takedown. They trade punches. Pettis lands the jab. Benavidez pushes Pettis against the fence. Close round. 10-9 Benavidez, 19-19. They come out swinging. Benavidez with a hard right hand and a spinning back fist that lands. They clinch but Pettis defending the clinch and takedown attempts well. Pettis lands a right hand as they break. They trade punches. Pettis with a knee to the body of Benavidez. Benavidez with some body kicks and he lands his punches. Pettis lands a right hand and a body kick. Benavidez goes for a takedown but Pettis grabs the neck for a moment before he lets go. Benavidez goes back for the takedown but Pettis gets away. Pettis lands a double jab and a body kick. Benavidez goes for yet another takedown and it is defended again. They break. Benavidez with a body kick and he gets a takedown. Pettis gets to his feet and has the neck. They break. They trade big punches and kicks late. Good, close fight. 10-9 Benavidez, 29-28 Benavidez. Smith with an early leg kick. Smith with another. They clinch and Smith lands a huge knee that drops Evans and Evans is out cold. Smith with one final punch for good measure as he gets the knockout win in less than a minute. A brutal finish and this is likely the end of Evans' career. They trade punches early. They clinch and de la Rocha has Coulter against the fence. Coulter with a short knee to the body. They break and Coulter lands a couple of big punches. They clinch and Coulter slips on a knee to the body and de la Rocha gets into the mount and lands some punches. Coulter gives up his back. de la Rocha looking for a choke. Coulter escapes and they get to their feet. Coulter lands some big punches and de la Rocha is rocked and in trouble. Coulter lands some more big punches. de la Rocha is cut badly above his eye. de la Rocha now landing big punches on Coulter against the fence. They are swinging and both landing big punches. Both look gassed. Coulter lands another big right hand. de la Rocha gets a takedown. Not much happened at the end. 10-9 Coulter. de la Rocha lands a big right hand. Coulter lands a huge right hand. They clinch and de la Rocha gets a takedown. Coulter gives up his back and de la Rocha looking for a choke. He looked to have it for a minute but lets go. de la Rocha landing punches but gets warnings for grabbing the fence a couple of times. de la Rocha looking for the choke again but can't get it. de la Rocha landing more punches from the back. Coulter somehow surviving. Both are exhausted. de la Rocha still landing from the top. The fight is finally stopped by the referee and de la Rocha gets the win. Lamas with a front kick. Lamas gets a brief takedown but Bektic right back to his feet. Lamas has the body lock on Bektic against the fence. Bektic is landing punches. Lamas with a couple of knee to the body but Bektic reverses position and lands his own knees. They trade knees. They break. Bektic lands a left hand. Bektic lands a right hand. Lamas with a leg kick and eats a right hand as he tries for a head kick. They clinch and Bektic with some short knees. They break but Bektic quickly grabs Lamas for a takedown. They get back to their feet. Lamas misses a spin kick. 10-9 Bektic. They come out trading to start the second. Lamas with a leg kick. They both defend takedown attempts from the other. Bektic lands a right hand and Lamas is cut open. They clinch and trade knees. Bektic has Lamas pinned against the fence. It was a headbutt that cut Lamas open. Bektic with an elbow. They break. Lamas tries for a takedown but Bektic defends it. They get up and break. They clinch again and each land but they break. They trade punches and Bektic lands a solid combination. Bektic lands a couple of solid punches as Lamas lands a couple of leg kicks. 10-9 Bektic, 20-18 Bektic. Lamas lands a right hand as he tries to change levels. Bektic counters with a right hand. Lamas fakes a takedown but eats some punches from Bektic. They clinch but nothing happens before they break. Lamas mistimes a spin kick and Bektic is able to score a takedown off of it. Lamas is able to reverse into side control but Bektic quickly scrambles back to the top. Lamas grabs the neck and is looking for a guillotine choke. He is squeezing but Bektic is holding on and broke out of it. They get up and Bektic has the body lock. Lamas grabs the neck again and was looking for a choke but lets go and lands some elbows and punches. Lamas tried for it again but Bektic slipped out and is on top. Bektic with a knee to the body. 10-9 Bektic, 30-27 Bektic. They trade punches and Esparza with a leg kick.Gadelha drops Esparza for a moment with a right hand. They scramble and Esparza working for a takedown but Gadelha sprawls and grabs the neck. They get to their feet and break. Gadelha with a right hand but Esparza with a leg kick. Gadelha lands a couple more hard right hands. Esparza clips Gadelha with a right hand and has her rocked. Esparza with another right hand and drags Gadelha down and is in the guard. Gadelha sweeps out by grabbing a leg. Gadelha then gets in the guard of Esparza. Both women landing punches on the ground. They scramble to their feet. Gadelha gets a takedown into side control. Gadelha with some hammerfists. Gadelha has a deep guillotine late but Esparza survives. 10-9 Gadelha. They come out swinging. Both land right hands. They clinch against the fence. Both battling for position and underhooks. Esparza has the better position. Gadelha reverses and has the body lock and gets Esparza down. Gadelha in the guard and landing punches and big elbows. Big elbow from Gadelha. They get to their feet and Gadelha gets another takedown. She is in real control of the fight now. Gadelha working in the half-guard. Esparza gets to her feet and quickly takes Gadelha down at the end of the round. 10-9 Gadelha, 20-18 Gadelha. Esparza lands a nice right hand at the start of the third. They trade right hands. Esparza with a front kick but eats a counter right hand from Gadelha. Esparza lands a couple of right hands. Esparza with a knee to the body. Esparza lands a combo. Esparza with a leg kick. Esparza with a combo. Gadelha looks to be trying to coast this round. Esparza lands another hard right hand. Esparza tries a kick but Gadelha grabs the leg and grabs the back. Gadelha with a suplex takedown and is in side control. Both landing on the ground. Esparza pushes Gadelha off and then gets a takedown and is in the guard of Gadelha. Esparza starts landing big punches from the top. Gadelha's right eye is closed. Esparza finishes with punches from the top. Close fight. 10-9 Esparza, 29-28 Gadelha. Overeem keeping his hands low. Nothing has happened 90 seconds into the fight. Blaydes misses a high kick. Blaydes gets a big takedown. Blaydes with some punches from the top. There isn't much happening otherwise. Overeem going for a leg lock late but isn't going to have enough time. A complete nothing round. 10-9 Blaydes. They are fighting now. Overeem with a big knee that hurts Blaydes. Blaydes looks for a takedown but Overeem has the neck. Blaydes completes the takedown and Overeem is looking for a heel hook. Blaydes gets out of it and jumps right back on Overeem. They get to their feet. Blaydes lands an uppercut. Overeem with a step in knee and Blaydes grabs him and gets a takedown. Blaydes in the half-guard and keeping Overeem pinned on the mat. Blaydes with an elbow. Blaydes with some late ground-and-pound. 10-9 Blaydes, 20-18 Blaydes. They trade punches. Overeem with a body kick. Blaydes lands a right hand. Blaydes with a hard right hand and a knee and then lands some punches against the fence and gets a takedown against the fence. Blaydes solidly in control on top. Blaydes then lands a huge elbow that rocks Overeem badly and then starts firing elbow after elbow and the fight is stopped as Overeem is out and is a bloody mess. A huge win for Blaydes and a dominant showing. Punk with a leg kick. Jackson lands a right hand. Punk lands a right hand and they clinch. Punk with a knee to the body. They break the clinch. Punk lands another right hand. Jackson lands a right hand. They clinch against the fence and Punk with a knee. Jackson with some body punches. Punk goes for a takedown but it is defended. They break and trade punches. Punk goes for a takedown but it is defended again. Jackson lands a left hand. Punk gets a takedown and steps over into half-guard. Punk lands a couple of punches but they scramble to the feet. Jackson with a body punch and a big elbow. 10-9 Jackson. Punk goes for a takedown and it is defended. They break the clinch. Punk lands some punches. 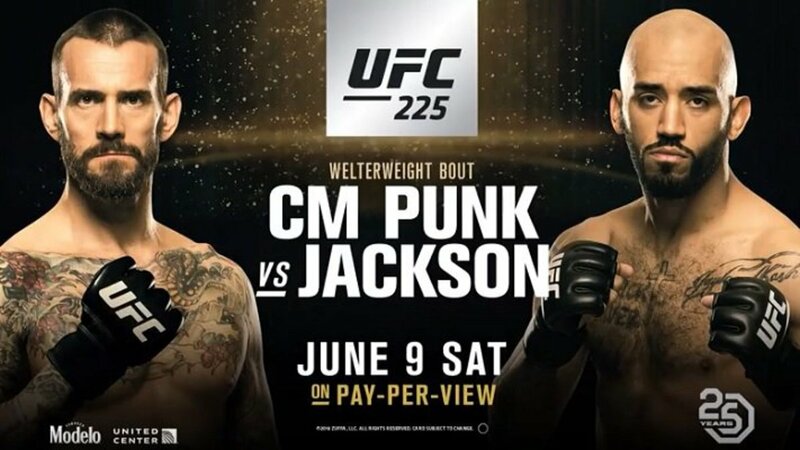 Jackson lands a right hand that hurts Punk. Jackson with an elbow over the top. Punk tries for a jumping guillotine and Jackson takes it to the mat and is in the guard of Punk. Jackson with some punches and elbows from the top. Punk is bleeding. Punk looked for a triangle choke but couldn't secure it. Jackson still on top and landing some punches to the body. Jackson with punches to the body. This isn't a good fight at all. 10-9 Jackson, 20-18 Jackson. They clinch and just nothing happening. Jackson lands a right hand. Punk goes for a takedown but eats a left hand and Punk flops to his back. Punk does land a left hand. Jackson lands a right hand. They clinch and Punk going for a takedown. They break and Jackson lands a right hand. Jackson with some elbows and they clinch and Jackson has the back. Jackson gets the takedown and is in side control. Kudos to Punk because he has heart but this has no business being on a UFC event. Jackson on top and lands some punches. 10-9 Jackson, 30-27 Jackson. They both land short punches. Arlovski lands a right hand and a leg kick. Tuivasa with a leg kick. Arlovski with a hard inside leg kick and he follows with a jab. Tuivasa gets a takedown right into full mount. Nothing is happening on the ground and they scramble to their feet. Tuivasa is cut open but drops Arlovski with a left hand and lets him up. Arlovski with a body lock and almost gets a takedown. Arlovski with a knee to the body. Tuivasa with a combo. They clinch and Arlovski with a knee. They break and Tuivasa lands a big punch. They trade right hands. Tuivasa slips after landing a head kick. 10-9 Tuivasa. Arlovski with a front kick to the body. Arlovski with some leg kicks. Arlovski lands a couple of solid right hands and then lands a leg kick. They trade and Arlovski lands a solid one-two combo. They trade big punches and Arlovski with a double jab. Tuivasa is a bloody mess but lands a right hand. Tuivasa with a leg kick. Arlovski with a spinning back fist. Tuivasa with a combo and Arlovski stumbles for a moment. Arlovski gets a brief takedown and we have a timeout as Tuivasa pokes Arlovski in the eye. We get back to action and both land solid punches. Close round and close fight. 10-9 Arlovski, 19-19. Tuivasa with a leg kick. Arlovski counters with his own but eats a right hand from Tuivasa. Arlovski with a couple of kicks and then he lands a right hand. They trade in close range. They trade again. Tuivasa with a right elbow. Arlovski with some knees in a brief clinch. Arlovski misses a head kick. Tuivasa hurts Arlovski with a right hand but Arlovski is recovering. Arlovski with a solid combo. This is gonna come down to the last minute. Arlovski with the jab. They trade strikes. Arlovski with the jab. Tuivasa with a right hand. They trade at the end. Close fight. 10-9 Arlovski, 29-28 Arlovski. They trade early. Holm with a body kick but eats a big knee from Anderson. They clinch and Anderson with another knee. Holm with a short elbow. Holm with a knee to the leg of Anderson. They stay in the clinch as Holm has Anderson up against the fence. They break. Anderson lands a knee. Anderson lands a short combo but eats a front kick to the face from Holm. Holm gets a takedown but Anderson is looking for a twist. Anderson lets go and Holm is in side control. Holm with an elbow from the top. 10-9 Holm. Holm coming out with some kicks. Anderson tries a kick but Holm grabs her and pushes her against the fence. They break. Holm with a body kick. Anderson tries a knee but Holm is able to counter into a takedown and is in side control. Holm landing punches from the top. Holm gets into full mount and lands some big punches. Holm working for an arm-triangle. She lets go but lands some big punches. Holm in control from the top. 10-9 Holm, 20-18 Holm. Holm firing kicks but eats a hard right hand from Anderson. Holm goes right for the takedown but Anderson is defending well. Holm pushes Anderson against the fence. Holm gets a takedown and is in the half-guard of Anderson. Holm gets into the mount. Anderson was looking to escape so Holm just got up and let Anderson up. Holm with a head kick followed by a leg kick and then a front kick to the body. Holm gets another takedown into half-guard. Holm moves to side control and lands some elbows. Holm back into full mount and with punches and shoulder strikes. Holm is going to cruise to victory on top. Great performance from Holm. 10-9 Holm, 30-27 Holm. They come out swinging and Covington right into a takedown. Dos Anjos back to his feet. Covington is all over Dos Anjos. They break. Dos Anjos with a leg kick and then lands a left hand as Covington clinches. Dos Anjos with a knee to the body. Covington with a high kick and back to the clinch but they break. Dos Anjos with a right hook to the body and then a knee to the body. They clinch and Covington with some short left hands. Covington trying a takedown but eats some elbows and a knee to the body. Dos Anjos with another knee to the body. Covington with some leg kicks. Dos Anjos lands a combo. They trade body kicks. Covington keeps going back to the clinch as Dos Anjos is landing more when they are separated. 10-9 Dos Anjos. Dos Anjos with a leg kick and they trade punches in close range. Covington gets a brief takedown but Dos Anjos gets up. They break the clinch and Dos Anjos with a big body kick. Covington goes for another takedown but Dos Anjos defending. They break and trade kicks. Dos Anjos landing punches to the body. They trade punches and Dos Anjos rocks Covington with a left hand. They trade punches. Covington lands an uppercut. They break the clinch with both utilizing dirty boxing. Covington gets a takedown and takes the back. Covington with some punches from the back. 10-9 Covington, 19-19. Dos Anjos lands some quick punches before Covington clinches against the fence. They break. They trade punches. Covington back working for a takedown but they break. Covington with some kicks. Covington back working for a takedown and gets it for a brief second. Covington lands a low blow on Dos Anjos and we have a break. Back to action and they trade in the pocket. They clinch and not much happens. Dos Anjos lands a big left hand as they break and Covington back to a takedown attempt that is defended. They trade kicks. Covington grabs the back of Dos Anjos. Not much happened afterwards. 10-9 Covington, 29-28 Covington. Dos Anjos lands a huge left hand to start the fourth. Dos Anjos gets a takedown on Covington. Covington scrambles to the sprawl and Dos Anjos has the neck. They get up and break and Dos Anjos gets another takedown. Covington with some deep breaths. They get up and Dos Anjos has the back and the body lock. Dos Anjos with some knees to the legs and he takes Covington back down. They get to their feet. They break. Dos Anjos lands a left hand. Dos Anjos gets a brief takedown but they clinch against the fence. They break and trade punches. Both land solid punches and now Covington going for a takedown. Covington lands an uppercut but eats a counter left from Dos Anjos. Covington gets a late takedown and ends the round on top. 10-9 Dos Anjos, 38-38. They trade early and Covington working for a takedown. Covington has the back. They break. Covington gets a takedown. Dos Anjos gets back up. They trade kicks. Covington working for another takedown. Covington hanging on to Dos Anjos but not really doing much. They break and Dos Anjos with a body kick. Covington lands a left hand and going back for another takedown. Dos Anjos with a right hand to the body. They break. They trade punches. Dos Anjos clips Covington with a left hand. They are battling in the clinch, Covington gets him down but they scramble back up. They trade punches. They are swinging in the last minute. Dos Anjos landing cleaner. Covington tries a takedown to no success. Dos Anjos with a body kick. Close fight. 10-9 Covington, 48-47 Covington.